WOW! Kmart will be open for 42 hours straight! Shop starting at 6am Thanksgiving morning and will close Friday at midnight. However, they open again bright and early on Saturday. 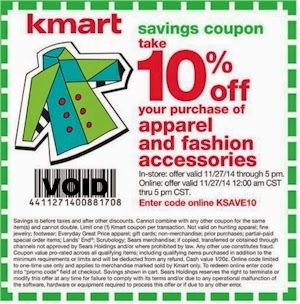 Many of this year’s Black Friday deals will also be available on Kmart.com, so if you’d rather shop in your pajamas from your living room, check back on Couponers United and I’ll let you know as soon as the best deals go live. 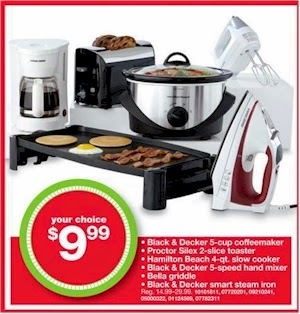 The main Kmart Black Friday ad is 56 pages long (there is also a supplemental 12 page Kmart Thanksgivings ad) , with literally hundreds of doorbuster deals. I couldn’t didn’t list every single deal, but I did go over the Kmart ad rather carefully, and below are the deals that I thought were the most outstanding. There are quite a number of them. The full Kmart ad can be viewed here, or here. Thanksgiving Morning Doorbusters 6:00 a.m. – 5:00 p.m.
Thanksgiving Night Doorbusters 7:00 p.m. – 3:00 a.m.
Black Friday Morning Doorbusters 6:00 a.m. – 12:00 p.m.
LG Blu-ray player, regularly $99.99, on sale for $49.99, plus Shop Your Way members get $5 in points (5,000 points). PNY 2200 Power Bank (can use with phone or tablet), up to 1X additional charge on your smartphone, regularly $14.99. Same price but Shop Your Way members will get 100% back in points, so this is effectively FREE. Save 25% on all Otterbox cases, regularly $19.95- $59.95, on sale for $14.96-$44.96, but does not include iPhone 6 Otterbox cases, plus Shop Your Way members get an additional 25% back in points. Sylvania 7″ portable DVD player, 2 per store, no rain checks, regularly $59.99, on sale for $39.99, plus Shop Your Way members get $10 in points (10,000 points). iLive Bluetooth On-Ear Headphones, on sale for $49.99, plus Shop Your Way members get $40 in points (40,000 points), so it’s like paying $9.99. InnoTab 3S Plus or InnoTab Max, regularly $79.99-$109.99. Get $10.00 off. Cannon printed or solid reversible comforters, regularly $19.99, on sale for $15.99. Other Cannon bedding and accessories also on sale. Cannon 300 thread-count or Essential Home 325 thread-count twin sheet set, regularly $29.99, on sale for $19.99. Cannon twin-size heated blanket, Sherpa lined, includes analog controller, regularly $49.99, on sale for $24.99. Other sizes also on sale. Essential Home 2-piece lamp set in a French bronze finish, regularly $49.99, on sale for $29.99. Other lamps also on sale. “Frozen” Elsa licensed hooded bath towel, regularly $12.99, on sale for $8.99. Other characters also on sale. Cannon 2-piece gift set, 50″ x 60″ throw, coordinating decorative pillow. Up to 8 patterns available, regularly $14.99, on sale for $7.99. 4- or 5-drawer chest in ebony, honey pine, walnut, or white finish. Regularly $54.99, on sale for $29.99. T-Fal 18-piece Banquet nonstick cooking set, regularly $99.99, or Farberware 10-piece stainless steel cookware set, regularly $79.99, on sale $49.99 for each set. Essential Home 3-pack non-stick frying pans, or 15-piece cutlery set, regularly $16.99-$19.99, on sale for $9.99 each. Color-changing LED globes, regularly $12.99, on sale for $6.99. 40% off LEGO sets, regularly $9.99 to $19.99, All LEGO City and Friends sets on sale, limited quantities, 3 per store, no rain checks. 50″ LED RCA 1080p HDTV, regulary $599.99, on sale for $399.99, plus Shop Your Way members get $50 back in points (50,000 points) to use within 90 days of receipt. Limit 2. Titan Heroes figures (The Hulk, Spiderman, etc,), regularly $12,99-$14.99, on sale for $7.99 each. WWE Gym Playset, half-price at $19.99. Other WWE and construction sets also on sale. Board games, i.e. CandyLand, Topple, Tumble, etc. regularly $6.99-$10.99, on sale for $2.99. Up to 75% off all fine jewelry, savings range from 50%-80%. Timex, Armitron and Casio. 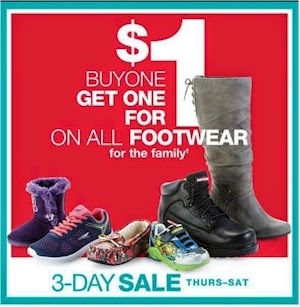 Buy-one-get-one-for-$1.00 on all footwear, some exclusions, no rain checks. Canon Elph 135 Digital Camera, regularly $119.99, on sale for $79.99, plus Shop Your Way members get $20 back in points (20,000 points) to use within 90 days of receipt. Limit 2. Logitech M325 wireless mouse, regularly $29.99, on sale for $19.99, plus Shop Your Way members get $15 in points (15,000 points), so it’s like paying $4.99. Check out MORE Black Friday Ads here! And join our FACEBOOK GROUP!